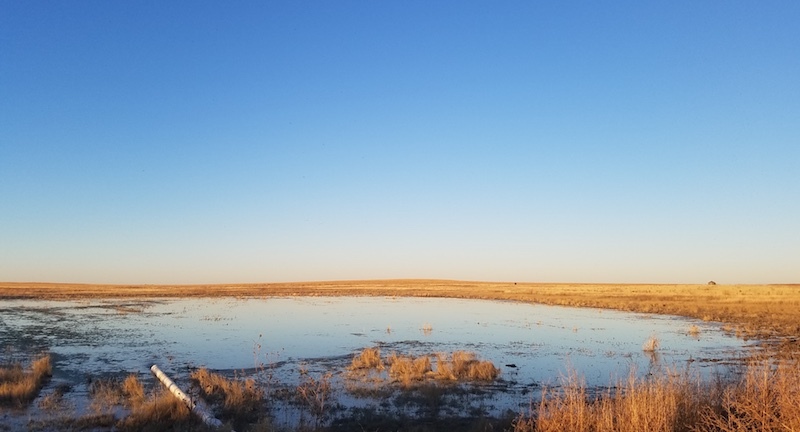 Ducks Unlimited was just awarded $859,500 from the North American Wetlands Conservation Act (NAWCA) standard grant program to conserve prairie wetlands, including playas on private lands, in Kansas. This project is a continuation of successful wetland conservation efforts by many partners including Kansas Department of Wildlife, Parks and Tourism, Pheasants Forever, Kansas Alliance for Wetlands and Streams, US Fish and Wildlife Service and Playa Lakes Joint Venture. Through this project, the partnership intends to restore more than 1,400 acres of playas and associated uplands through various practices, including filling pits and ditches, planting grass buffers, removing sediment buildup, installing culverts, and constructing levees. This effort will use USDA Farm Bill conservation programs and partner programs to provide incentives for playa conservation. The partners also plan to enhance or restore over 1,300 acres of non-playa habitat, which will include at least 120 acres of easements. Additionally, wetland restoration at Quivira National Wildlife Refuge, Cheyenne Bottoms, and Wild Turkey Playa Wildlife Area will provide critical migration stopover habitat for waterfowl, shorebirds, wading birds, and other migratory birds. The proposal includes the restoration of 8,330 acres, including 6,367 wetland acres, on public access land which will benefit the public by providing improved water and air quality, flood abatement, and wildlife habitat.